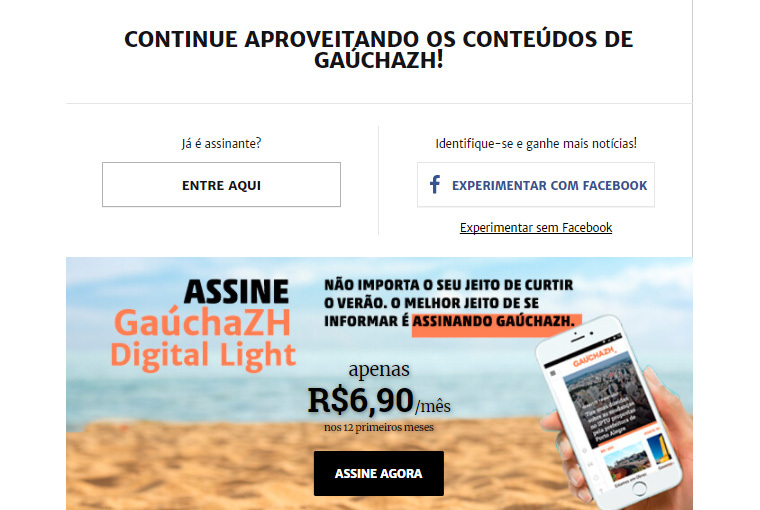 SUMMARY: GaúchaZH is reaching more subscribers by changing its communication with readers, improving the user experience, and reaching out to those who are not as familiar with digital publication. Let’s face it: We are all fighting hard in the battle for audience. The competition for attention has never been so difficult, and some global players are not that keen to play fair. In addition to losing users, we are also losing engagement, recurrence, and depth. How can this be reversed? For those who have a solid subscriber base, the answer is to put the user at the center of the analysis. And, have no fear to go offline to attract digital readers. 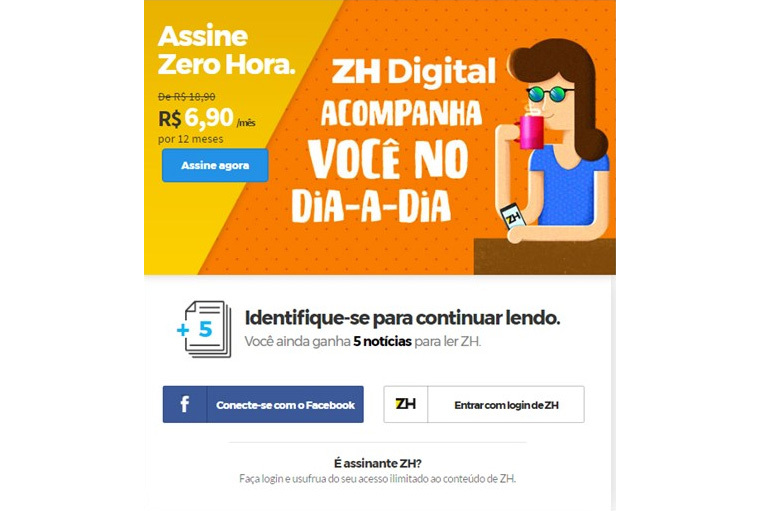 At GaúchaZH is a digital platform that recently united the forces of two major newsrooms in southern Brazil (Zero Hora newspaper and Gaúcha radio station). Our subscribers are mostly print based, so we have the challenge of converting them to digital. And we are doing it. Our paywall is a modern combination of “freemium” and “metered” that allows testing of conversion hypotheses, with flexible parameter management and different rules per platform. The number of logged subscribers climbed from 23% last year to 35% in November — a 52% increase. Today, more than 82% of our printed subscriber base has created a login to our Web site. To get these results, usage and database management teams worked close to the IT and development team. And they work hard. 1. Changed the style of our communication: We improved the terms in our actions. We are using “Hello, subscriber” so the subscriber understands we are talking to him/her. We understand using modern and techinical words kept us at a distance from our audience that is older or fearful of the unknown. We exchanged words like “login,” “newsletter,” and “pushes” to “subscriber register,” “news by e-mail,” and “notifications in the cellular,” for example. 2. Created an exclusive space for the subscriber: Inspired by the News For Betty case (a site created specifically for a woman who could not navigate the Internet due to sites’ styles), we created a landing page for “our Betty,” where we explained how to access our platform and the whole process step-by-step. 3. Improved the technology experience for log-in creation and recovery: We trace all feedback information back to the user and redraw the flow without a dead end. In addition, since all the contacts in the previous flow were unanswered mailboxes and non-existing phone numbers, we created the option of recovery by social security number and date of birth. This is much better than having to reach a call center. Users were clicking in the wrong places on the old sign-in page. The new log-in page is much more intuitive and better communicates the company’s message. 4. Changed the sign-in screen: Believe or not, our previous sign-in screen did not carry the word “subscriber” in a clickable button. On other hand, the subscriber-focused message that we used to have wasn’t clickable (on the bottom), but an analysis via Hotjar revealed the message was one of the most “clicked,” proving that the screen wasn’t clear at all. That is why we made a drastic change on it. And, by the way, in our funnel, in just November, the sign-in screen was responsible for more than 20% of our new subscriptions. Using printed resources, the media company has directed readers to its online spaces. 5. Finally, we stopped using only digital media to communicate with the subscriber: Since our subscriber base is still mostly print, we went to paper to talk about digital. Simple, right? We managed to have a fixed space in the footer of the “daily reader newspaper page” that provided direct messages and reminders on the advantages of the digital access. Our columnists have also published, in their prime printed spaces, small tips on how to reach a landing page designed to help readers who do not normally use digital media. We took a very serious the path to go from URL to IRL (in real life) and vice versa! Sabrina Passos is digital product manager of Group RBS (Zero Hora) in Porto Alegre, Rio Grande do Sul, Brazil. She can be reached at sabrina.passos@zerohora.com.br or @sa_passos.